Join the discussion on our forums! Come discuss Shakru, the Collector over in our dedicated Shakru, the Collector discussion topic. Aya even staged an intervention once, but Shaku still insists that he is not a hoarder. This card is so underestimated. Use your noodle, and he'll survive two turns or force the opponent to remove while unable to handle other threats. Also, that stealthed 2/3 sitting there (and often ignored) does 10 damage with 2 x Cold Blood cast on it. Just saying. Just opened the golden version of Shaku in what's probably the last MsoG pack I'm getting :) Looking forward to playing him! Can't say this card is good, but it definitely is fun. If your opponent cant remove it or is a pirate warrior, you can get some insane value out of it. I find it extremely difficult to mulligan this card, or even draw it before turn 10 (if I last that long). Anyone knows what's the name of the music that plays when you summon Shaku? It's driving me insane, I know it but I can't remember from where. Lorewalker Cho's Play 2 sound maybe, it has a similar sounding Play 2 sound. That card is surprisingly good. Opened him yesterday and he often draws me more than one card. The trick is to play him smart, so that your opponent will have to choose value targets (for example playing him T3, then Tomb Pillager on T4), depending on the board state. It's not instant dust, that's for sure. Because he just can't stop salivating. i had a golden copy of this card. it's now dust. While most people are comparing this to Undercity Huckster, I think a more apt comparison is Mana Tide Totem. Both draw you a card for use on your next turn, and both continue to do so each subsequent turn if they survive. This draws you slightly weaker cards on average, but it also has power, which means your opponent can't trade into it for free. This lacks tribal synergy but has Stealth synergy instead. All in all, I think it's at least on the same level as Mana Tide, and that card sees plenty of play. Solid, powerful legendary. Mana Tide draws at the end of your turn, so you can't make use of that card that turn. No different from Shaku. What kind of AOE deals 3 damage for a reasonable price? They aren't going to Flamestrike your Shaku. If they could afford to, you'd have lost already. Wrong ... mana tide will always draw at least 1 card regardless of what your opponent does. 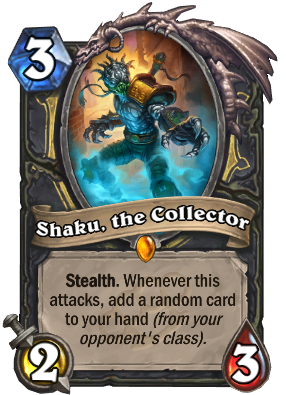 Shaku could easily be killed before your next turn and hence not draw any cards. Easily killed by what? You guys are joking? The only "EASILY" things that can kill him is Hellfire / Shadowflame and Lightning Storm with Highroll or SP totem.